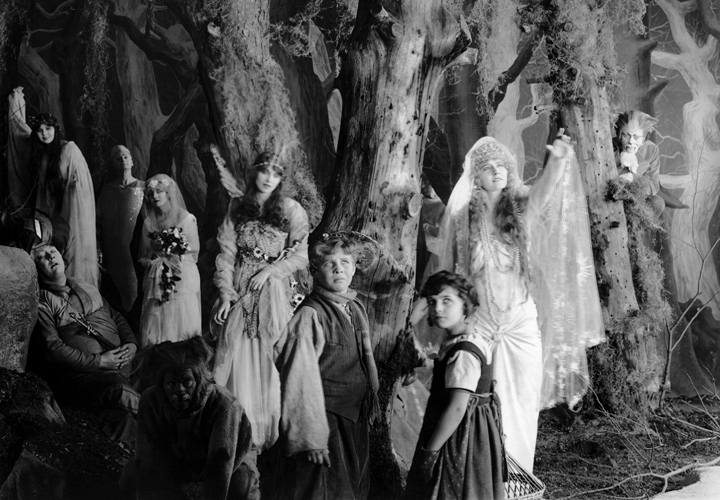 If there were such a thing as a practical course that prepared one for becoming a filmmaker, Maurice Tourneur took it. Trained as a graphic artist and illustrator, he served apprenticeships with sculptor Auguste Rodin and muralist Amelie Puvis de Chavanne. Switching to theater, he served as an actor and as a director in some 400 productions over the course of 11 years. Sensing the possibilities of the new medium, he then trained in the film industry, eventually becoming one of the most honored directors of the silent era. The Blue Bird is one of four Tourneur films in the National Registry, all dating from his American period (1918-1928). All share a strong visual aesthetic — which first propelled, then hindered Tourneur’s career. Here he’s at the height of assured inventiveness with a fairy-tale subject that’s but one of five film adaptations of the popular 1908 play by Belgian playwright and Nobel-winner Maurice Maeterlinck. Today, Maeterlinck is best known for creating the source material for Debussy’s sole opera, Pelleas et Melisande. The playwright was fond of symbolism and allegory, which made an impact with the audiences of the time, but which seem like a passel of condescending homilies today. Returning empty-handed, they find the Bird in their home as it was all the time. They give it to their sick friend, who promptly loses it but remains healthy and happy. Breaking the fourth wall, Tyltyl encourages the audience to find the Blue Bird in their own humble homes. Backed up by a creative team that stuck with him for several productions, Tourneur was able to design and execute a sumptuous visual plan. Every setup is art-directed to within an inch of its life, every frame is a little artwork. This kind of attention to detail was by and large extremely unfamiliar to American moviemakers, who thrived on action and improvisation. Tourneur’s mature artistic integrity made him an auteur long before the phrase became popular. A menagerie of smoothly executed effects proved dazzling. Though sometimes credited as an influence on German Expressionist film, Tourneur’s approach is much more of a direct influence on the creative team behind Douglas Fairbanks’s 1924 starring fantasy vehicle The Thief of Baghdad. Tourneur showed that a comprehensive and coherent visual world could be constructed on film, through ardent discipline that exploited the possibilities of production design. Other film version of Blue Bird include a 1940 Technicolor outing starring Shirley Temple — specifically programmed to counter the smash hit Wizard of Oz the previous year, it bombed big-time. An infamous, all-star 1976 American/Soviet coproduction directed by a 77-year-old George Cukor cratered as well. In the end, Tourneur’s desire not a just be a cog in a major studio’s machine prompted him to leave America while filming The Mysterious Island and return to France. There he overcame the poor opinion of those French who thought of him as a World War I draft dodger; later he made films in a tense truce with Nazi occupiers. Tourneur’s last great film, Le Main du Diable (Carnival of Sinners, 1943) was a parable about an artist making a deal with the Devil. The NFR Project is one writer’s attempt to review all the films listed in the National Film Registry, in chronological order. Next time: Broken Blossoms.